A homemade pasta salad recipe with lots of fresh vegetables, including mushrooms, snow peas, bell pepper and fresh parsley in a red wine and Dijon vinaigrette dressing. 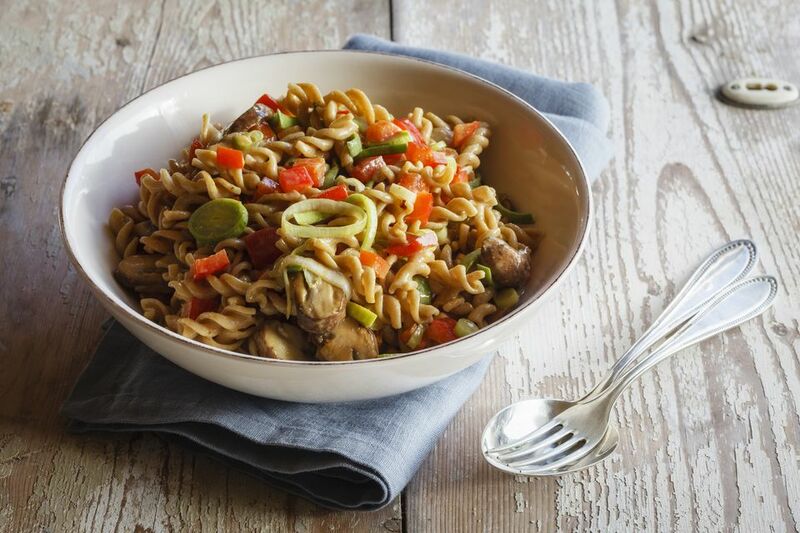 This is a low-fat, vegetarian and vegan pasta salad recipe, and, if you use a gluten-free Dijon mustard, this recipe is suitable for those with gluten sensitivities too. Recipe courtesy of the Wheat Foods Council. Prepare pasta according to package directions; drain. Rinse in cold water and drain thoroughly. In a large bowl, mix vegetable oil, lemon juice, vinegar, mustard, oregano, thyme, parsley, and mushrooms. Add snow peas, peppers, and pasta; mix thoroughly. Refrigerate for one hour and serve. Makes six servings of cold mushroom pasta salad with bell peppers and fresh parsley.